I took the plunge in the third quarter of the year. I’m teaching a class on electricity: seven Thursday afternoons in January, February, and early March to learn about batteries, circuits (parallel and serial), LEDs, motors, switches and ultimately robots. So far, three of these classes have run. Here’s what we’ve done so far. First up was this circuit. 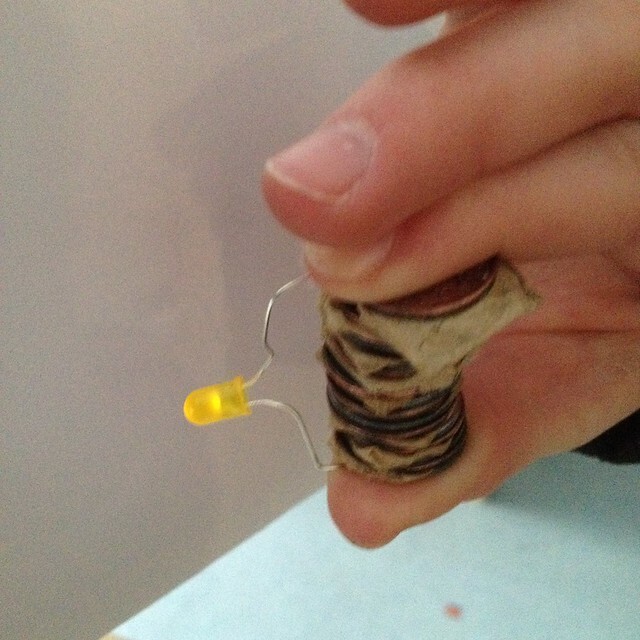 It’s built out of a piece of cardboard, some brass fasteners, paperclips, some electrical tape, and a single LED. The fasteners and paperclips act somewhat as nominal resistors. It worked fine. Eventually, rummaging around in some old electronics parts someone had given us, I found and identified an ambient light señor, and wired that in (lower left). Then, when it’s in shadow, it diverts more power to the LED — otherwise, it only lets through a trickle, and dims the LED. Kids found this project frustrating while they were bulding it, and were overjoyed to show their parents when they were done. We started on this project — with second graders, mind you! — because I wanted them to start experimenting with circuits right away, and I wanted them to discover the joys and challenges of testing circuits. 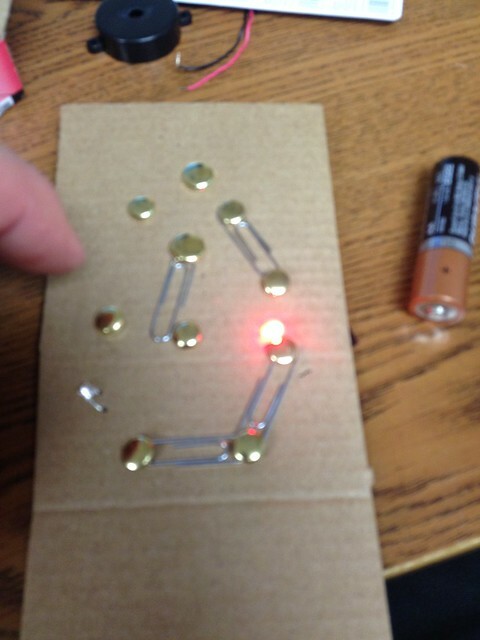 Virtually everyone got their circuit working, but not everyone was able to keep their LED lit until parents showed up at the end of class… there were a lot of very excited kids. The second thing we built was a homopolar motor. I wish I’d remembered to take photographs of them, but they’re so fragile, and most of my demonstration models got bent or damaged long before I had a chance to demonstrate their usefulness or to explain what they reveal about electricity to my students. I learned a lot from building them, not least of which was trial and error — particularly about which kind of magnet to use — but they’re not very durable for kids’ playtime. Addendum: I forgot about this paragraph, because I remember being so disappointed with the homopolar motor, that I forgot that we had this success in the same class. In the same class we built the homopolar motor, we also built electromagnets — simply a coil of wire around a nail, and both ends of the wire attached to a AA battery. Only 1.5V is enough to pick up a couple of paperclips. With very young children, I’ve been trying to avoid using large batteries; pretty much everything I build a) came from research on Pinterest, and b) was scaled down to use a 9V or less. 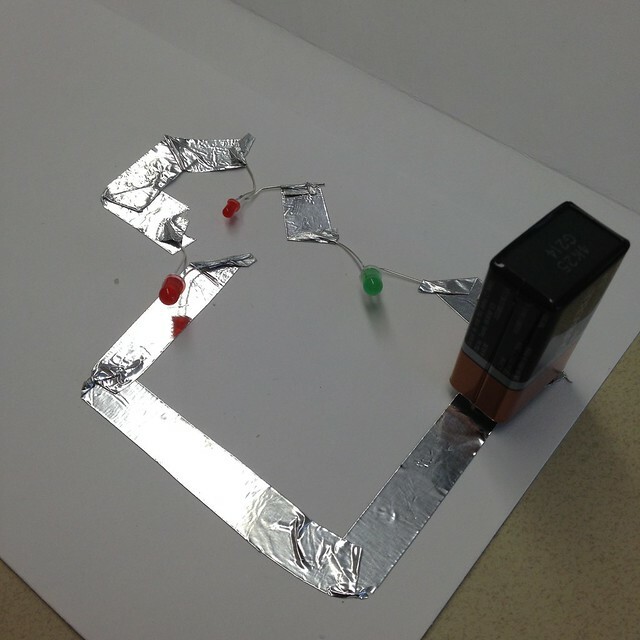 The third (fourth) thing was building a little card with a parallel circuit on the inside of the front cover, and a serial circuit on the inside of the back cover. I must admit, I never got a picture of one of these cards actually working — because we burned out more LEDs in this one project than I had purchased for the whole class. Shows you what I know about the mathematics of electrical engineering. On the other hand, I have a lot of pictures of my experiments in my notebooks, most of which were failures. LEDs in general require a little less than 2V of power, and these got 9V. Three LEDs at 2V apiece means that these took 6V of a 9V battery. It’s a wonder they didn’t pop and die faster than they did. The parallel circuits were worse, of course. If you wire three LEDs of different kinds/voltage tolerances into a parallel circuit, that usually blows the LEDs out, and there’s not much to do but toss them. Even if they’re the same, the LEDs divide their voltage by their quantity, so the parallel LEDs drew about 0.67V of a 9V battery. The pop of their death was audible. Today was a particularly special class. We built a battery. I showed the students how to soak paper towels in lemon juice, and place them in the right order, in stacks, between pennies and zinc washers. We were able to build an extremely wet, lemon-scented battery that could light LEDs for short periods of time — basically until the lemon juice dried out —out of stacks of ten of these penny/lemon juice paper/zinc washer power units. I think the multimeter indicated that our strongest battery today was about six volts. Near the end of class, I broke out a copy of the Periodic Table of Elements. We realized that the battery we built was exploring and exploiting the differences between copper and zinc, which are on the same row but in adjacent columns of the PToE. And then we looked how Nickel-Cadmium batteries and lead-acid and lithium ion batteries might each exploit differences between different elements. Is what I taught them today perfectly right? No. But they learned that perfectly ordinary household products can generate electricity under the right circumstances, and that the right circumstances involve finding one or two metals and an acid which works with and against both metals. I’m most impressed with our second graders, though. We wound up having to have a serious conversation about safety, and they got it. They got themselves calmed down and pulled together, and we had a great class after that. More than that, I showed them how to set up a work station for themselves: a knolled pair of scissors, a stack of pennies and a stack of washers, a cup of lemon juice, a little tray to hold their parts. They learned how to use a multimeter and how to share a multimeter, and how to teach each other to use the multimeter. And they learned how to clean up from this kind of work, too. I’m sure we’ll have to have that conversation again about safety — it’ll be one of those conversations we’ll have again and again over the next six years that most of them will be at my school. But kids all over school had a chance to see our batteries in action, to know that they work. More and more parents and teachers are seeing the real, hands-on value of our Design Thinking classes — and the kids are having a lot of fun while learning complicated things. After we return from break, we have a few more classes, and I’ll try to write about those, too — in which we’ll learn to make a simple motor, to make a wiggle-bot, and maybe a miniature Van de Graff generator. I have to see if I can build those last two over our winter vacation, next week. I feel like such a mad scientist these days. And very much like a magician. Man, you are one very cool teacher! That’s some Mr. Wizard level stuff you’re pulling off! My science classes were as dry as the wastes of the Sahara until I got Terrence Beauregard Lee in high school. You’d have been the talk of my elementary school for sure. Thank you. The thing that I like is that I’ve now built up a supply of electrical components — LEDs, resistors, batteries, buzzers, motors and other components. And our 2nd grade boys and some others now have skills with these components, which means that these components should start showing up in projects throughout the school. That’s my goal, anyway.